Rob Bertolini, the new Fort Lee High School Football Coach, and his team of exceptional assistant coaches, are working diligently to make 2014 a great year for our football team. But they need the support of the community to succeed. 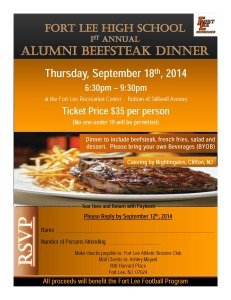 On September 18, 2014, from 6:30 P.M. to 9:30 P.M., there will be a fundraiser for the Fort Lee High School Football Team at the Fort Lee Recreation Center. It will be $ 35 per person, monies that will be used to ensure that our team has the best equipment and the finest training program of any school in the area. Please note the attached Flyer for further details. PLEASE COME OUT AND SUPPORT BRIDGEMEN FOOTBALL!